Gallbladder wall of a human patient with gallstones. The duct (clear zone at center) is lined by highly polarized epithelial cells with dark nuclei at the base. At the top of the picture, below the epithelial layer, there is a large volume of foamy macrophages laden with cholesterol. The patient subsequently underwent gall bladder removal surgery. 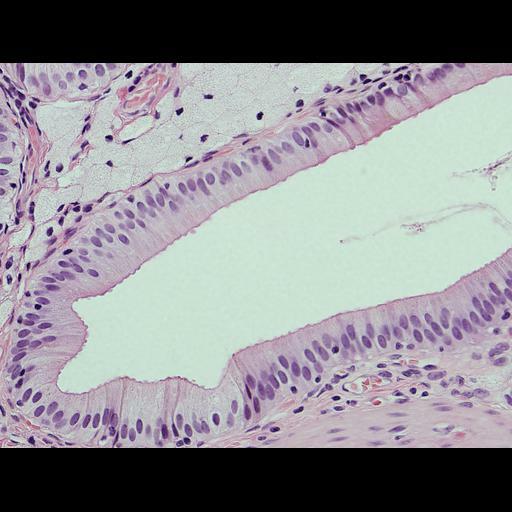 Tissue was prepared by standard histological methods for pathology. Biopsy was fixed, cut, and stained with hematolylin and eosin. Images were collected using an Olympus BX51 scope, DP71 camera, and a 40x objective. Spatial scale is approximate based on known size of cell nuclei.